Castor canadensis, believe it or not, is a time shifter. 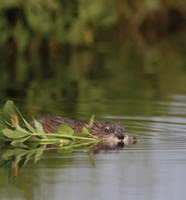 The humble, hardworking rodent, through its dams and ponds, can extend the release of water late into summer, saturating the ground and healing watersheds. It has the power to re-create the primordial, wetter West that existed for millennia -- a West we just missed seeing. "Restoration of the beaver is restoration of a landscape we don't have a cultural connection to," O'Brien says, "because they largely were trapped out."